A Scottish couple who went on the run from police and were arrested in Spain after appearing on a "most wanted" list have been sentenced for fraud offences. 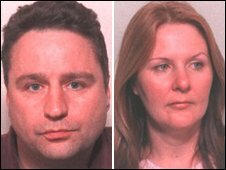 Anthony Kearney and Donna McCafferty were tracked down in the Costa Blanca town of Benissa in November 2008. The pair had featured in a Crimestoppers appeal to catch on-the-run British suspects. At Glasgow Sheriff Court, Kearney was jailed for two years and McCafferty was given 250 hours community service. The couple, who have a six-year-old son, committed benefit fraud by claiming housing benefit when they had more than £330,000 in offshore accounts. Kearney, 45, also claimed for almost £23,000 in income support and pocketed more than £10,000 from credit card frauds. 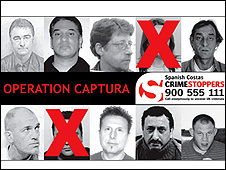 They went on the run after a money laundering investigation was launched against them in May 2004. Sentencing the couple, Sheriff Sean Murphy QC said: "You have pled guilty to what is a significant fraud on the public purse." At an earlier hearing, Kearney, who is currently serving a five-year sentence for attempting to extort £35,000 from a businessman, admitted defrauding more than £42,300 from the Department of Work and Pensions between December 1997 and March 2004. He also admitted defrauding £10,350 from the Bank of Scotland and Clydesdale Bank by using a false identity to take out credit cards. The former antique dealer also pled guilty to using fake company names to transfer £126,400 into an offshore account in October 2003. McCafferty, 43, from Airdrie in Lanarkshire, admitted defrauding more than £13,000 in housing benefit between November 1999 and March 2004. She was originally charged with a string of further frauds amounting to more than £74,000 but the Crown accepted her pleas of not guilty to these offences. The pair were eventually tracked down living in a detached villa in Benissa, near Alicante, just 24 hours after a high profile appeal was made for their arrest. Defence advocate Simon Gilbride, representing Kearney, told the court that his client took full responsibility for the offences and that his partner's involvement was simply signing forms that he asked her to.